I've always wanted to learn French. It has been one of those desires that I've never actively pursued, but always assumed that one day I will magically find the time to do. Receiving a copy of the Lonely Planet Kids: First Words: French has gotten me one tiny step closer to realising this desire, at least for the 100 words included in this clever little book! 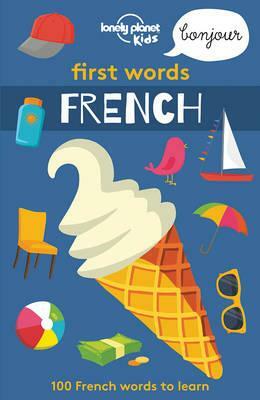 Designed to look like a chunkier and slightly larger format version of the ever popular Lonely Planet phrase books, Lonely Planet Kids: First Words: French is a gorgeous travel or home companion for any kid from three (to 33!) who wants to learn the most basic (and likely practical) words of this beautiful language. On one side of each double page spread is a word in both English and French, with a phonetic spelling of the French pronunciation underneath, while the opposite page offers a bold illustration of the word in bright and enticing colours. The overall presentation of the book is simply beautiful, with a sturdy plastic coated cardboard jacket that will wear very well in any travel case. Each book also comes with a code to a free audio pronunciation guide that is accessible through the lonely planet website, with all audio pronunciations done by children. This series also offers a Spanish (KBR review) and English (KBR review) version.